Mitt Romney tried on Wednesday to pin a federal agency's Las Vegas spending spree on the Obama administration, but gave the president a pass on the widening scandal involving members of the Secret Service and military who allegedly hired prostitutes while on assignment in Colombia. The marks were a contrast to Romney’s assertion that the administration “obviously is embarrassed” by the revelation that the General Services Administration hosted an $823,000 conference near Las Vegas in 2010. He said top GSA official Jeff Neely was pleading his Fifth Amendment rights as an “excuse” to not have to testify in the case. Speaking more generally about government corruption including the GSA scandal, the Secret Service scandal, and the Justice Department's botched "Fast and Furious" gun-tracking operation, Romney said he would “clean house” if he were president. On WTVN, Romney also fielded questions about his vice presidential pick. He declined to provide a short list, but did talk about a “debt of gratitude” for help he had received in the Ohio primary from Sen. Rob Portman, R-Ohio, who is widely perceived as a top possibility. “I think his strength and his endorsement and his campaigning with me across the state really made a difference. That kind of a victory in Ohio was one of the things that propelled me to become the presumptive nominee. So I’m in a great debate of gratitude to Rob Portman and recognize that yeah, he makes a difference in Ohio but he would make a difference on a national ticket as well. 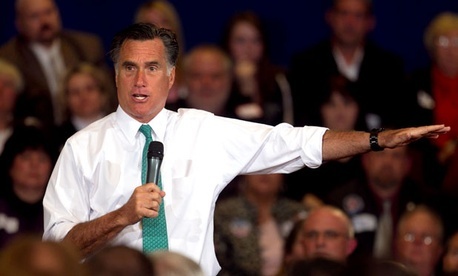 He’s a great guy and a very capable person,” Romney said. Matthew Shelley contributed to this report.